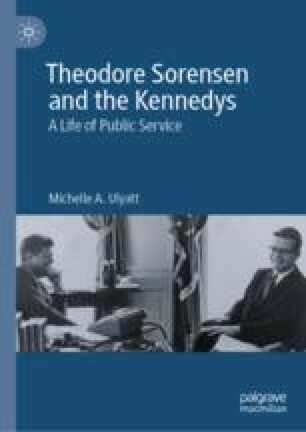 Ulyatt provides a useful overview of Kennedy’s transition to power in 1960 and examines how Theodore Sorensen carved out a unique role as Special Counsel to the President. The chapter explores how Sorensen set the agenda for the Kennedy administration through his leadership of a series of task forces that developed legislative proposals for the new government to pursue. It also identifies Sorensen’s central role in crafting the famous rhetoric of John F. Kennedy’s Inaugural Address, which focused on the themes of public service and national renewal. Further to this, the chapter examines the decision-making structures that Kennedy established in the White House and determines the part Sorensen played in supporting President Kennedy’s ambition to exert greater executive power over the other branches of government. Bailey, John M. 1964. Interview by Charles T. Morrisey. John F. Kennedy Library Oral History Program, April 10. https://www.jfklibrary.org/Asset-Viewer/Archives/JFKOH-JMB-01.aspx. Bell, David E. 1965. Interview by William T. Dentzer Jr. John F. Kennedy Library Oral History Program, January 2. https://www.jfklibrary.org/Asset-Viewer/Archives/JFKOH-DEB-02.aspx. ———. 2002. Interview by Vicki Daitch. John F. Kennedy Library Oral History Program, September 10. https://www.jfklibrary.org/Asset-Viewer/Archives/JFKOH-JKG-01.aspx. Kaysen. Carl. 1966. Interview by Joseph O’Connor. John F. Kennedy Library Oral History Program, July 11. https://www.jfklibrary.org/Asset-Viewer/Archives/JFKOH-CK-01.aspx. ———. 2008. “An Evening with Ted Sorensen, May 28, 2008.” John F. Kennedy Library Forums. https://www.jfklibrary.org/Events-and-Awards/Forums.aspx?f=2008. ———. 1961. “Inaugural Address, January 20, 1961.” John F. Kennedy Presidential Library and Museum. https://www.jfklibrary.org/Asset-Viewer/BqXIEM9F4024ntFl7SVAjA.aspx.